Do not call Boston Chops a steakhouse – it is an “urban steak bistro”. It resides in the space where Banq and Ginger Park failed on Washington St in the South End. It’s been getting some great reviews, so I chose it for my birthday dinner. We had an early reservation, so the restaurant was only half full. We were seated in the row of high tables, adjacent to the bar area. Steve was able to watch the Preakness and keep one eye on the baseball game throughout our meal. The room is done in dark wood and leather like most steakhouses, I mean, urban streak bistros. 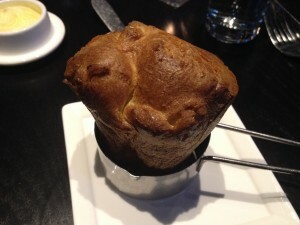 The meal began with complimentary popovers. They were served warm, and were light, tender and airy. I loved them. I wonder if I could have ordered a basket of them. We started with the mussels ($14); they were served in a wide bowl with a roasted marrow bone nestled in the middle, topped with grilled bread. 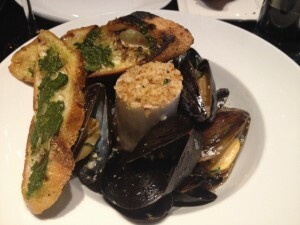 The mussels themselves were plump and tender, although it was a small serving. The bone marrow really confused me – what was I suppose to do with it? I first tried it with the mussels, but the strong beef flavor overwhelmed the brininess. I smeared a little on the bread, but that already had an herb paste. I mixed some in to the broth, but they did not provide me with a spoon for it and scooping it up with a mussel shell was awkward. There is a section of the meal titled “Rarely Celebrated” that offers all the nose to tail eating a girl could wish for. I could not decide; I read great reviews of the crispy oxtail croquettes, and the grilled herb marinated heart. There were also beef cheeks and my perennial favorite, sweetbreads. Ultimately, I followed my server’s recommendation of the tripe ($8). I am glad I did; the tripe was so tender and tasty. 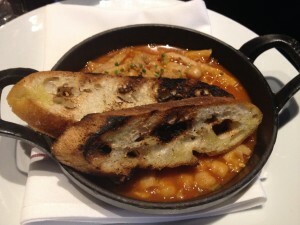 It was braised with garbanzo beans, in a soffrito ragout. I wish more restaurants would serve tripe. It came with plain grilled bread, so I finally had a vehicle for the roasted bone marrow. Boston Chops offers steaks a la carte ($39 - $56). These are large cuts (14oz to 22oz) and they come alone; austere on a large white plate. 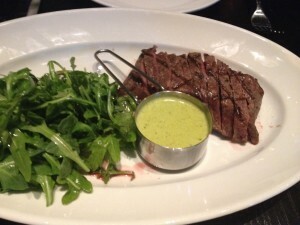 Another option is steak frites; there are 6 cuts offered, all 8oz cuts, served with fries, seasonal greens and a sauce. I chose the prime flatiron steak ($24), which is a cut I have never tried before. The steak was a perfect medium rare and had great beef flavor. I was worried when I heard that all the steaks are wet-aged (dry –aged is always preferable), but the steak was a nice balance of tender and flavorful. The chimichurri butter was a great accompaniment – rich and a little zesty. Last night’s greens were arugula; I thought it was salty, but Steve really liked the salad. The fries were similar to McDonald’s, in size and color, which is not a bad thing. My favorite part is that the fries were unlimited; we finished our initial serving and the server came back with a large copper bowl and bestowed another helping of hot fries on us! 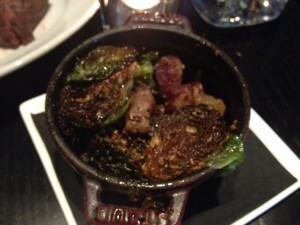 We also got an order of Brussels sprouts ($9). We were told that the sides served 2-3 people, but the tiny serving vessel contained exactly 6 sprout halves. They were overly greasy and brunt. The large bacon chunks were the only redeeming facet of the dish. Steve enjoyed his glass of cabernet sauvignon and my cocktail was excellent. I really liked our server; she was friendly, attentive and I enjoyed both her cocktail and tripe suggestions. The desserts have earned good reviews, but Steve suggested we walk to nearby Picco for ice cream instead. It was a nice night – perfect for a après dinner stroll. I ended my birthday meal with a delicious rum raisin ice cream.